I want to tell you about our friend Jeannie. Jeannie had breakfast with us every morning from the time we opened, January 8th, until about 2 months ago. If I didn't walk in at 7:30 am and see Jeannie in the back corner booth eating a waffle, grits, and drinking an OJ, then I worried about what was going on that morning. As soon as she was done eating, she would join Larry or Elizabeth in the dish room and knock out our morning rush of dishes. Jeannie helped us more than she will ever know, but more than that she became a friend to all of us. Jeannie cared about the A Place at the Table community and each one of us truly cared about her. I met Jeannie in January, shortly after A Place at the Table opened. Her humor, winning personality and ability to advocate for her needs engaged me. She let me know the effort she made to care for herself and the way she would be treated differently if people thought she was homeless. She had dignity and respect for herself and made effort to demand that from others. She put herself into challenging situations because she wanted to help other people. That sometimes brought trouble, like when somebody she befriended broke into her car. She kept her car and all her belongings in it as her tether to her life before the death of her daughter and husband. Parts of her life would slip into and back out of conversation. Others she met were also engaged and fond of her humor and tried to support her getting to safety. She was awarded three months rent to help her get started, but she had to find a job that would make rent and a place she could afford. Her first attempt at a job would only give her 20 hours a week at minimum wage. Not enough for rent. She did get a 40 hour a week job, but still not enough for rent. Rent is high and wages are low. Churches and social services are downtown. City transportation is improving but bus passes cost money. Without a car she'd have to walk a couple miles to get a donated bus pass. Homeless people work hard. So Jeannie worked, but had no home. She stayed in a shelter until her adult son arrived. She couldn't leave him alone so left the shelter. She slept outside. Her hip got sore on concrete. People bothered her at night offering drugs which she didn't want. A homeless person was beat. These things occupied her mind and her desire to get to a better life. Not every story ends happily, unfortunately. We received news recently that Jeannie has died. Our community mourns the loss of Jeannie each morning and we will think of her always. We cared about Jeannie, we care about you, and we have a place at the table for each and every person who feels the cracks are getting wider. We hope to see you at the table soon. 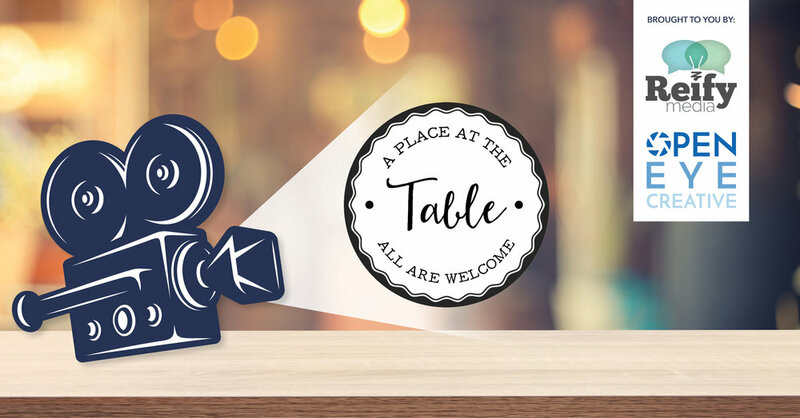 Come join us at A Place at the Table on Friday, August 3rd as we host a viewing party for a video created for us by Reify Media and Open Eye Creative. Drinks and snacks prepared by Chef Andrew will be provided. Drop in anytime from 5-7. We'll see you there! Copyright © 2018 A Place at the Table, All rights reserved. Thanks for signing up for A Place at the Table's newsletter. We cannot wait for you to be a part of our community. Thanks for helping us provide community and healthy food for all regardless of means. See you around the table soon!